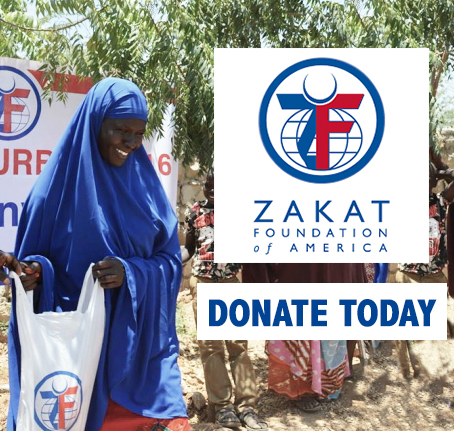 The Islamic Medical Association of North America (IMANA) has conducted medical relief missions around the world and provided funds for hospital projects in over 20 countries for over fifteen years. Now with increased turmoil and desperate needs for ongoing medical care in Africa, the Middle East and the Caribbean, IMANA often finds itself sending its volunteers to places other organizations don’t feel comfortable going. Their most recent trips have been to Sudan that is under an US embargo where internal refugees are not receiving services; the Syrian “urban refugees” living outside of Jordan’s refugee camps; and Haitians living in the countryside still without clinics, hospitals, or access to clean water after the 2010 earthquake. IMANA is headquartered in Lombard, Illinois with the mission of providing a forum and resource for Muslim physicians and other health care professionals; promoting a greater awareness of Islamic medical ethics and values among Muslims and the community-at-large; and providing humanitarian and medical relief and to be an advocate in health care policy. IMANA grew out of the Muslim Students Association and became an independent organization in 1968. The medical relief part of the organization conducts over 100 projects worldwide. These include long term projects such as the 6 hospitals build around the world and one under construction in Kenya to rapid response projects as after the earthquake in Haiti or the tornados in Garland, Texas. The majority but not all of the projects are in Muslim majority countries and 30% of their volunteers are non-Muslims. The organization’s medical relief projects have served over one million patients in the last 14 years. Dr. Ismail Mehr has been the IMANA Director of Medical Relief for 15 years and spoke about his experiences both in directing IMANA’s missions all over the world and his personal role in recent mission to Sudan and Jordan. He was a past president of the organization as well having direct experience leading medical relief teams like the one to Gaza in 2009 after Operation Cast Lead. IMANA was the only American NGO to be there providing medical services to the hundreds of injured civilians. To understand the type of healthcare services IMANA provides to severely underserved populations and ones that other NGOs neglect, we have to go in depth into some of IMANA’s most recent missions in February and March of this year. 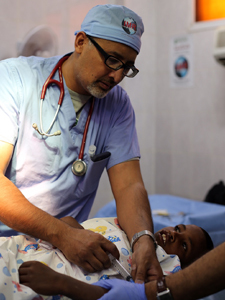 Dr. Mehr led the 7th annual mission to Sudan for their “SaveSmile” campaign in Khartoum in late February and early March where volunteer plastic surgeons conduct surgeries for children suffering from cleft lips and cleft palates as well as train local surgeons to do the work themselves. On this trip 219 surgeries were performed. These children have difficulty eating and speaking as well as ever getting married. With the embargo on the country, many other NGOs from the U.S. will not go and many complain of not feeling safe. Dr. Mehr has found the IMANA missions helping change the Sudanese perceptions of Americans especially because of an organization that has been coming to do this work annually for seven years. The State Department is very aware of their missions and all is legal and approved. Nevertheless, the IMANA team has to be careful about what supplies are allowed into the country and sometimes has difficulty having supplies donated when they are intended for use in Sudan. In March of this year, 15 IMANA volunteers conducted the organization’s first mission to support Syrian refugees in Jordan. This was a unique mission in another way that IMANA focused on what are called “urban refugees” who are the refugees from Syria who came to Jordan early in the war and are not in one of the refugee camps near Amman, but are scattered throughout the city and surrounding villages. The largest camp in the area is the Zaatari camp run by the UN that has about 400,000 Syrian refugees. There are other American NGOs that service the camp like the Syrian American Medical Society who conduct regular missions to Zaatari. There are between 1 to 2.5 million Syrian refugees in Jordan. The IMANA mission set up a free medical clinic for these refugees in the areas around Amman who have no access to healthcare at all as many came to Jordan looking for work, which has been difficult to find. These “hidden” refugees are not provided assistance by the UN or any other organization. IMANA partnered with United Muslim Relief who did all the logistics of the trip to set up primary care clinics for the refugees. One was in Amman itself where a local hospital donated clinic space. The IMANA volunteers also set up a clinic in Zarqa, a town northeast of Amman where there are between three to four thousand Syrian families. These very poor families cannot afford to pay for healthcare so the free clinic is the only health services they receive. The overwhelming majority of the families are widows with children. The IMANA team will return to Jordan in mid-May. interviewed about her experiences as a volunteer team member on two Haiti trips. The first was last year and the most recent one in March of this year. The focus on the IMANA missions to Haiti is to provide basic preventative healthcare and education. Outside the largest city Port-au-Prince, there is no established healthcare system. In the rural areas, there are no hospitals or clinics and in most places no access to clean water. IMANA started its missions to Haiti in 2010 following the disastrous earthquake, with organizing 14 relief missions spread throughout that year and their volunteer physician teams treated over 30,000 patients in the first three months following the earthquake. But as Dr. Sheikh explained, the political unrest following the earthquake disrupted the country’s healthcare system leaving it almost non-existent. IMANA established the HOPE (Haiti Out-Patient Establishment) Clinic in Miragoane to provide primary healthcare to the rural population of the country. Since 2010, 190 IMANA Medical Relief volunteers have visited and treated over 14,000 patients from newborns to the elderly. In 2015 IMANA established a soup kitchen for poverty-stricken children, serving 500 meals per month. The IMANA team goes to the established clinic in Miragoane every year. The number one illnesses treated are malnutrition and dehydration due to the continued lack of food and water resources. For Dr. Sheikh who grew up in India and was familiar with extreme poverty, the most shocking experience about coming to Haiti is the lack of clean drinking water. She saw little change in the conditions from one year to the next with limited electricity and running water being even unavailable for the medical staff. Asked to describe one of her patients who epitomized the healthcare problems in Haiti, Dr. Sheikh described how there is no pre-natal care at all. Many young women do not even know they are pregnant until they come to the clinic 6 or 7 months along. HIV is still a major problem in Haiti and without pre-natal screening, many of these same woman don’t know that they are caring the HIV virus and can pass it to their infants with preventative care. One of her 18 or 19 year old patients was breast-feeding her baby and not aware that if she does have HIV, she will be passing it to the infant through breast feeding. Much of what the IMANA teams do in Haiti is to create awareness through flyers and treating their patients – providing education on hygiene and other issues that can prevent the spread of disease. IMANA’s Medical Relief missions have a significant impact on the 30 countries where they have ongoing projects. Whether it is in Sudan, Jordan, or Haiti, all of their patients are in great need of the medical services IMANA provides on a regular basis. Not only are their patients provided the only healthcare they ever receive, but local physicians are trained to take over when the IMANA staff leaves. 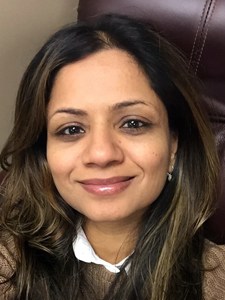 The volunteer physicians and healthcare staff are seen as people who provide free healthcare when many other organizations have forgotten these severely underserved communities. Many aid organizations were involved when the earthquake hit Haiti in 2010, but IMANA is one of the very few who stayed and continues to return every year. IMANA is active in recruiting primary care Physicians, Pediatricians, Ob-Gyn, Family Practice, Emergency Medicine, Internal Medicine, 3rd or 4th-year medical students, Nurses and Pharmacist volunteers for all of its medical mission trips. Non-medical volunteers are also welcomed to provide logistic and administrative services like registering patients. Just as not all of the countries served have Muslim majorities, as indicated above, 30% of IMANA’s volunteers are non-Muslim. The organization also welcomes donations that can help provide for purchases of medical supplies especially for countries like Sudan where supply donations are hard to come by. You can visit www.imana.org for more information. I hold a bachelor degree in social work and a master degree in counseling with a concentration in gerontology. I have worked for DCPS as School Guidance counselor for 10 years. Currently. I’m working as therapist for Inner Family Services in Washington, Dc. I’m Haitian and looking for job opportunity there where I can serve my country. If interested, a copy of my resume will be send at your request. NSA Spying on Palestinian-Americans for Israel and for the U.S.